This volume covers the language situation in Hong Kong, Timor-Leste and Sri Lanka explaining the linguistic diversity, the historical and political contexts and the current language situation, including language-in-education planning, the role of the media, the role of religion and the roles of non-indigenous languages. Two of the authors are indigenous to the situations described while the other has undertaken extensive field work and consulting there. The three monographs contained in this volume draw together the literature on each of the polities to present an overview of the research available about each of them, while providing new research-based information. The purpose of the volume is to provide an up-to-date overview of the language situation in each polity based on a series of key questions in the hope that this might facilitate the development of a richer theory to guide language policy and planning in other polities where similar issues may arise. 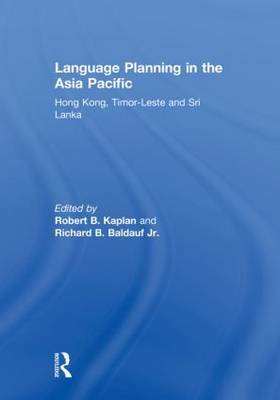 This book was published as special issues of Current Issues in Language Planning.